It is disappointing that in a speech intended to help Americans understand the state of the union, President Obama failed to take note of the extent of the country’s economic pain and the role that Wall Street greed and the deregulation of financial markets played in creating the economic crisis. The country continues to confront a relentless mortgage crisis and stubbornly high unemployment. The nation needs seven million new jobs just to get back to where we were in December 2007 – and we need even more jobs than this today because we’ve had three years of growth in the working age population. Solving the jobs crisis – more than 14 million workers are unemployed and the figure rises to 25 million if we include those who are underemployed – needs to be at the top of the national agenda. Yet it received no mention in the President’s description of the State of the Union. The State of the Union was very much focused on the future, and winning it. The unabashedly optimistic view of America as a country that is open for business and does big things apparently precluded any discussion of the past, of how we got into the recession and financial crisis, and any discussion of unpleasant realities like the millions of people who have lost their homes or their jobs and have plunged from economic stability into extreme economic insecurity. While unemployment was not addressed, there were two concrete proposals in the SOTU. Home prices continue to fall, dropping a full percentage point in November, according to the Case-Shiller 20-City index. Nineteen of the 20 cities in the index showed a decline in prices, with the sharpest declines occuring in Atlanta, Chicago, Cleveland, Detroit and Minneapolis. San Diego was the only city where prices rose, albeit by only 0.1 percent. The 20-city index has fallen at an annual rate of 11.9 percent over the last three months and is down by 1.9 percent year over year. The price declines continue to be led by the bottom third of the market, which is in a virtual free fall in several cities. In Atlanta, prices for homes in the bottom tier fell by 9.4 percent in November and have fallen at a 69.6 percent annual rate over the last three months. In Minneapolis, prices for bottom-tier homes fell by 1.7 percent in November and dropped at a 40.9 percent annual rate over the last three months. The annual rate of decline for bottom-tier homes over the last three months was 16.3 percent in New York, 21.7 percent in Boston, 28.8 percent in Chicago and 31.8 percent in Portland. For more info, check out our latest Housing Market Monitor. The labor market recession continued to exact a toll on union membership in 2010. According to the latest Bureau of Labor Statistics Union Membership report, the unionized share of the U.S. workforce dropped to 11.9 percent last year from 12.3 percent in 2009. The private sector unionization rate fell to 6.9 percent in 2010, from 7.2 percent in 2009. Even as employment losses slowed in 2010, unions continued to lose members, compared with 2009 where union membership and overall employment decreased at about the same rate. In 2010, union rolls shrank by about 600,000 members. Over 2009 and 2010, the Great Recession helped to reduce union rolls by more than 1.3 million members. In the absence of federal support for state and local governments, public sector cutbacks will continue to depress the overall union membership rate. For more info, check out our latest Union Membership Byte. A new feature here at the CEPR blog. Once a week, we'll post a list of labor market related policy research reports from progressive research centers around the country. This week's batch includes new reports from CEPR, the Center for American Progress (CAP), the Center on Budget and Policy Priorities (CBPP), Demos, the Economic Policy Institute (EPI), the Institute for Research on Labor (IRLE) and Employment at UCLA, and United for a Fair Economy (UFE). The piece is a good overview of recent developments, but could give readers the misimpression that the labor market is performing well for older workers. In fact, older workers have not been spared in the economic downturn. Indeed, their continued presence in the labor market is more likely a sign of economic stress than of economic success. Sorry, Census. Poverty Really Did Increase in 2009. Between 2008 and 2009, unemployment increased from 5.8 percent to 9.3 percent, the largest one-year increase on record (which goes back to 1948). Over the same period, the number of Americans without health insurance coverage rose by more than four million—from 46.3 million in 2008 to 50.7 million in 2009—and low-income people lost insurance at a greater rate than Americans overall. Thus, it isn't surprising that the Census Bureau's official poverty estimates show that the number of people who were impoverished in 2009 increased by 3.74 million, and the poverty rate increased from 13.2 percent in 2008 to 14.3 percent in 2009. More surprising is an "alternative" poverty estimate Census quietly released earlier this month. 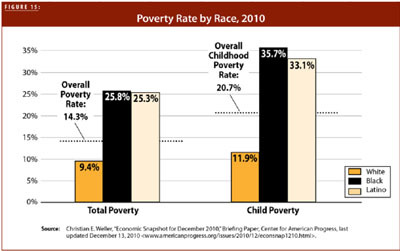 This estimate, highlighted today in a New York Times editorial, shows no increase in poverty between 2008 and 2009. Given the record increase in unemployment and huge decline in health insurance coverage, especially among low-income people, could this alternative estimate showing no increase in poverty really be correct? The short answer is no, but it takes some unbundling of the numbers to understand what's going on. Certain benefits that were expanded in the Recovery Act, particularly food stamps and refundable tax credits, are not currently counted in the official poverty measure. The alternative poverty measure cited by the NYT counts these benefits. Thus, one explanation of the apparent disconnection between unemployment and poverty is that the food stamp and refundable tax credit provisions in the Recovery Act were large enough (and targeted in a way) that prevented any actual increase in poverty. In advance of Martin Luther King Day next Monday, United for a Fair Economy has released its 8th annual "State of the Dream" report, surveying the economic challenges facing workers of color. The 2011 edition focuses on the impact of economic austerity on African American and Latino workers. The report documents several ways in which the austerity agenda sweeping Washington hurts the African American and Latino middle- and working-class. 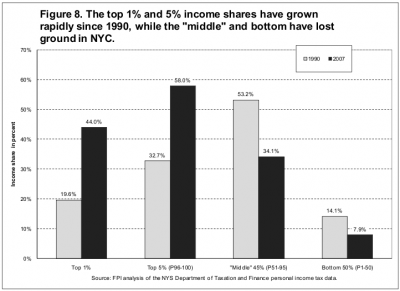 (1) Tax cuts for the rich flow overwhelmingly to whites. (2) "The attack on the public sector through pay freezes, furloughs, layoffs and proposed cuts is an attack on Black workers," who are disproportionately employed in federal, state, and local government. 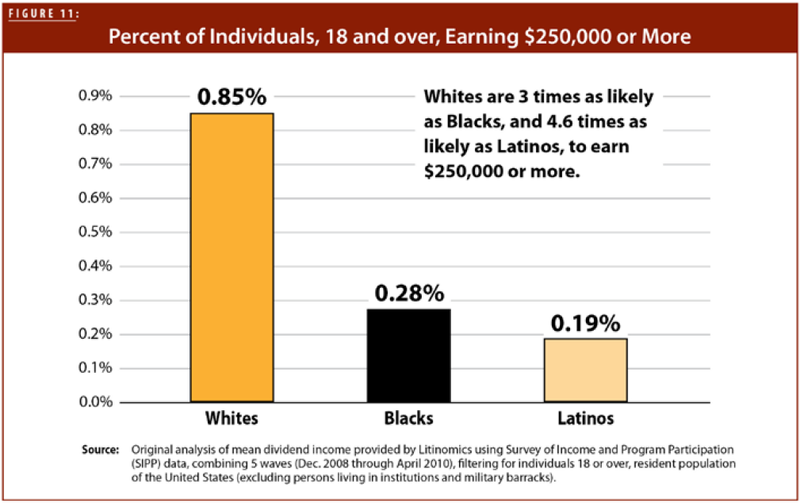 (3) Because a higher share of African Americans and Latinos are poor, "[c]uts to social safety nets hit Blacks and Latinos hardest." 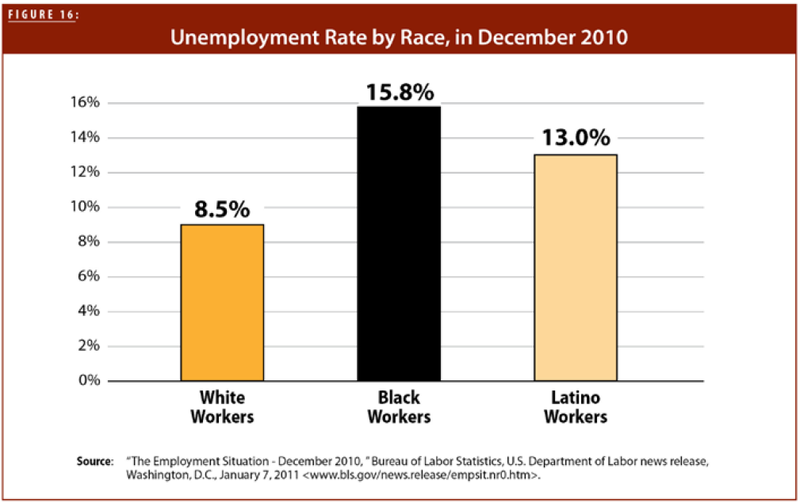 (4) Because African American and Latino workers also face the highest rates of unemployment, the failure to create a large-scale jobs program hurts them most. As Dean Baker pointed out earlier today, the drop in the unemployment rate announced this morning was due in large part to people giving up looking for work and dropping out of the labor force. There don't appear to be any areas of the economy with strong job growth now, nor for the rest of 2011. One potential bipartisan job creation strategy is work-sharing. Just before the election, the Frum Forum highlighted it as "A New Jobs Stimulus the GOP (and Dems) Can Back." And Dean teamed up with Kevin Hassett of AEI last year in a joint op-ed in the LA Times to explain the good reasons to use work-sharing to create jobs and avoid layoffs. Work-sharing (a.k.a. short-time compensation) already exists in 18 states. According to the U.S. Department of Labor,* there were over 153,000 participants across the nation in June 2009, a more than 12-fold increase from just over 12,000 participants in January of 2007. 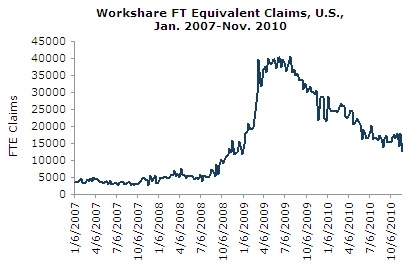 With work-sharing claims averaging a bit over 1/4 of a job, that represented about 40,000 full-time equivalent jobs during the peak weeks. Participation has varied widely from state to state. Rhode Island has seen the highest participation rates, with a peak of close to 7,000 participants, or over 1,800 FTEs, in May 2009. Over 20% of unemployment insurance claims in Rhode Island were from work-sharing when the program was at its peak. That's a lot of folks who have been able to keep their jobs, and most of their pay, during the recession. Just imagine if more states performed as well as Rhode Island. And it's not too late. Since employers both hire and fire workers every month, the reported jobs numbers are the net total of jobs created and lost. Work-sharing would help lower the unemployment rate by reducing the extent of layoffs. 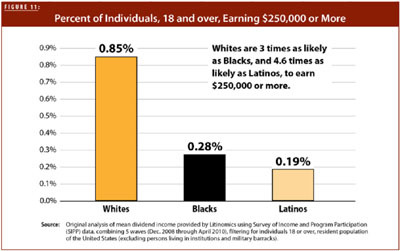 *Source: Employment and Training Administration, U.S. Department of Labor. Please contact CEPR if you'd like to see the data. The Bureau of Labor Statistics' latest employment report shows that unemployment dropped to 9.4 percent, the largest percentage-point drop since April of 1998. However, much of the reason for the decline was a drop of 260,000 in the size of the labor force. While the reported gain of 290,000 jobs in BLS' household survey is healthy, it's inconsistent with so many people leaving the labor force and may just be an aberration. It is worth noting that average weekly unemployment claims are still averaging more than 400,000. The economy did not start generating jobs at all following the last recession until weekly claims fell below 400,000 in 2003. On the whole, this report does not suggest a very positive picture of the labor market going into 2011. The decline in the unemployment rate is certainly positive, but with employment-to-population ratios (EPOPs) hovering near their low point for the downturn, the main story appears to be people giving up looking for work. Furthermore, there is no sector that appears to be experiencing robust job growth at the moment, nor any likely candidates for the near future. Across the nation, federal employees are getting undeserved lumps of coal in their Christmas stockings this year. When President Obama signed the 2 1/2-month extension of government operations yesterday, it included a 2-year pay freeze for federal workers. While the White House argues that the freeze will save $5 billion by the end of 2012, CEPR's Dean Baker points out that this reduction in money that federal workers have to spend will lead to drops in private sector employment in 2011 and 2012 of 7,000 and 18,000 jobs, respectively. If you are truly concerned about the long-term fiscal health of the country, then the 2010 Financial Report of the U.S. Government reminds you of some recent happy news. As we all should know, the long-run threat to the deficit is health care. According to the latest numbers, the 75-year shortfall in Medicare has fallen by $15.3 trillion in the last year—from 4.8 percent of GDP to 2.7 percent. From where did such a large deficit reduction come? According to the report “the decrease is primarily attributable to provisions of the ACA as amended by the Health Care and Educational Responsibility Act of 2010”—that is, the recent health-care reform. Total costs of running Medicare—Parts A, B, and C-- are projected to be 5.3 percent of GDP over 75 years compared to 7.4 percent last year. In other words, health-care reform is projected to save Medicare 28 percent. It is important to realize just how large (2.1 percent of GDP) are the savings that the recent health care legislation has offered. By comparison, the shortfall in Social Security is $5.8 trillion, or 0.6 percent of GDP. In other words, the fall in Medicare deficits have fallen by enough to cover that of Social Security more than three times over. Anyone who frets over the Social Security “crisis” should be overjoyed by the ACA and working to strengthen and extend heath care reform—not aiming to further lower the retirement prospects of current and future retirees. Initiated in late 2007, the Term Auction Facility (TAF) was the first of the Federal Reserve’s many liquidity facilities intended to stem a financial collapse by providing financial institutions with emergency funding. The TAF was intended to alleviate some of the stigma on Wall Street against borrowing from the central bank’s discount window. The program was structured to provide low-interest, short-term loans (set to mature in either 28 or 84 days) to all eligible depository institutions, with investment-grade assets held as collateral. The terms and specific beneficiaries of the facility were kept secret until earlier this month, December 2010, when a Congressional mandate forced disclosure. We now know that hundreds of banks, both American and foreign-based firms, accessed short-term funding through the Federal Reserve’s program. In cumulative terms, the Fed auctioned off over $3.8 trillion through the TAF, from late 2007 to early 2010. The top ten participating institutions at the TAF accounted for nearly $1.8 trillion – or nearly half – of cumulative borrowing from the Fed. CEPR Co-Director Dean Baker has been busy speaking about the tax deal and debating the deficit hawks. On December 1st, he was on a panel about the Fiscal Commission and alternative progressive blueprints for economic recovery with Nobel Laureate Joseph Stiglitz at the National Press Club. On December 16th he appeared on a panel on the effects of deficit reduction on the disadvantaged at the Brookings Institution. (You can watch a video of the panel here). And the very next day he was at the Aspen Institute, debating Grover Norquist and Andrew Stern on the “Contours of US Deficit Reduction”. You can hear what Dean had to say about “shared sacrifice” here. Dean also took to the airwaves as well, talking taxes on Bloomberg TV and about the Deficit Commission on PBS' Nightly Business Report. CEPR Senior Economist Eileen Appelbaum was at the Department of Labor last week, meeting with top officials to share the results of a study she completed with CUNY’s Ruth Milkman on the effects of California’s Paid Family Leave law, six years after its implementation. Look for the formal release of the paper in mid-January, including events in both Sacramento, CA and Washington, DC. CEPR Director of Domestic Policy Nicole Woo was a panelist at a conference held by the White House Initiative on Asian Americans and Pacific Islanders (AAPI) on December 10th. She presented CEPR's research on AAPI workers and recommended improvements to the data collected about AAPIs in the Census Bureau's main data sets. Still, I remain curious about the Leonhardt argument, which is a common one in the liberal community. Is it true? Does knowing that you have a safety net make you more likely to get up on the trapeze and try something risky and new? The analogy is wonderful, but that doesn’t make it true. Surely, though, this is a testable hypothesis? Not a provable one, of course, but one where evidence can be amassed on different fronts based on measurements of social safety nets in different times and places vs. risk-taking behavior in different times and places. Has anyone ever done this? It seems like a pretty obvious thing to try to study. The New York based Fiscal Policy Insitute has a great new report (pdf) out on rising economic inequality in New York state and New York City. 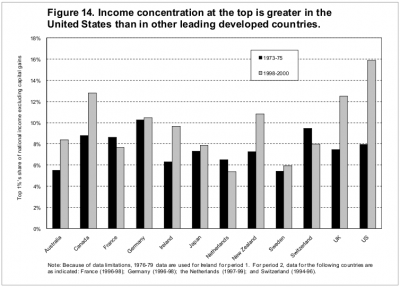 The FPI researchers have used state income tax data to do a state-level analysis of income concentration, modeled on the path-breaking research by Thomas Piketty and Emmanuel Saez, who used IRS data to look at national income inequality in the United States from 1913 to the present. Here are just a few highlights. 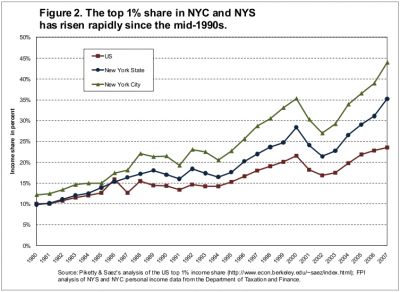 First, over the last 30 years, economic inequality increased more rapidly in New York state than it did in the economy as a whole, and more rapidly in New York City than it did in New York state. 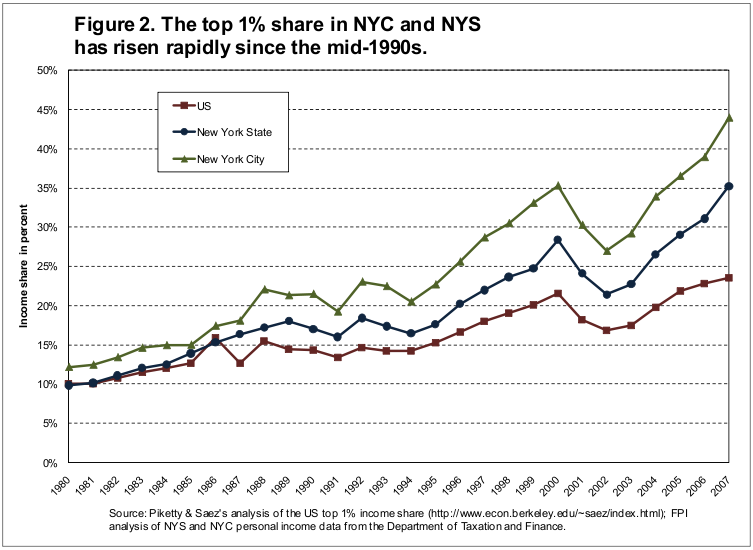 Second, the middle and the bottom saw their share of total New York City income plummet since 1990. 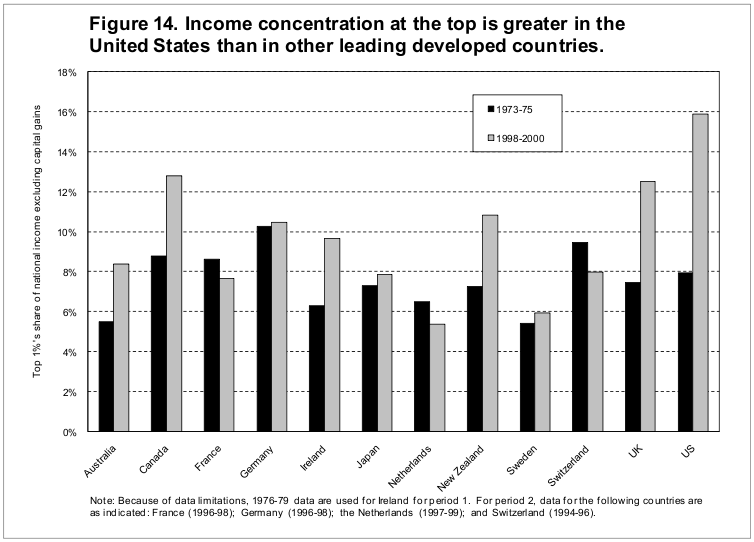 Third, the increase in income inequality in the United States far outpaced what has happened in other rich economies. That could have been the lead of a front page Washington Post news story reporting on a press conference in which former President Bill Clinton touted the budget deal that President Obama negotiated with the Republicans. Remarkably, President Clinton's record on these issues was never mentioned in the article. As many former aides have acknowledged, President Clinton had been considering a variety of options for partially privatizing Social Security in the beginning of 1998 when the Lewinsky scandal exploded. With his presidency in jeopardy, Clinton had to rely on his core constituencies -- labor, the African American community, women's organizations -- all groups that would have been infuriated by an effort to privatize Social Security. As a result, Clinton was forced to abandon this effort. President Clinton also set the economy on a path of bubble led growth, touting the stock market bubble that drove growth in the late 90s. He also pushed for the financial de-regulation that helped clear the way for the abuses of the housing bubble era. In addition, he also actively promoted the high dollar policy that led to the enormous trade deficit, which was another major imbalance distorting the economy's growth path. During his campaign, President Obama openly criticized this bubble-led growth path. Competent news reporters would have pointed out the irony that at this moment Obama now appears to be embracing the economic legacy he criticized. They also would have pointed out that Obama is relying on a Democratic president who was actively planning to privatize Social Security, ostensibly to curb fears that his deal could lead to the privatization of Social Security. Mary Bottari has a good post on the Federal Reserve Bank’s role in the ongoing financial bailout. The media and voters have focused on the Troubled Asset Relief Program (TARP) legislation passed in a hurry late in 2008. 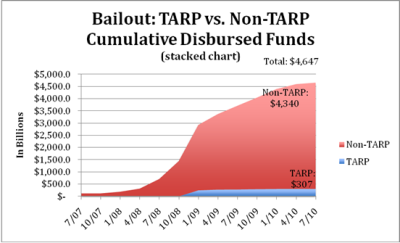 But, as Bottari emphasizes, the TARP is only a minor part of the federal bailout of the banks. The Fed has also purchased a lot of troubled assets from financial institutions, helping to clear those bad loans from the private sector’s balance sheets in quantities that dwarf the Bush administration’s TARP. Where I differ from Bottari is on the implications for taxpayers. She argues that the Fed’s actions put taxpayers at risk. But, even if every asset the Fed bought suddenly lost all its value, US taxpayers need not be on the hook for any of the losses. The Fed has limitless ability to print money. The only risk here is that the Fed’s actions increase the money supply and that this results in inflation. But, as with other discussions of Fed policy (quantitative easing, for example), the challenge we face now is deflation, not inflation, so the risks are slight. The spirited and principled rejection of the tax cut compromise by progressive Democrats in Congress is as welcome as it is unexpected. The deal between the White House and the Republicans , as Bob Borosage of Campaign for America’s Future observed, was “far more a deal to keep the economy from slowing than to get it going.” Facing negotiations with a nihilistic Republican leadership, avoiding a complete stalemate in which workers lost much needed unemployment insurance benefits, the Bush tax cuts for the middle class were rescinded, and low-income working families lost the expanded earned income tax and child tax credits seemed to be as much as could be hoped for. The price exacted by the Republicans was steep: extension of the Bush tax cuts for the top 2% of households, exemption from inheritance taxes for estates up to $5 million dollars and a 35% maximum rate on estates in excess of that amount, and a 15% maximum tax rate on income from dividends and capital gains. As progressive Democrats in Congress have made clear, tax breaks for the wealthiest Americans are not only unconscionable but they make no economic sense. The Congressional Budget Office ranks these types of tax cuts as among the least effective ways to increase growth and jobs. All the happy talk from the Administration and some economists about the boost to growth and jobs from the tax cut deal is just that – happy talk. Allowing tax cuts for the middle class and unemployment benefits for the long-term unemployed to expire would reduce incomes and are contractionary; letting them continue, however, does not raise incomes in January above where they were in December so these policies provide no additional stimulus to the economy. Very little in the tax package provides a stimulus. It is surprising, therefore, that Mark Zandi told reporters that he expects the tax compromise to add as much as a full percentage point to economic growth in 2011, bringing it to 4%. He also expects the unemployment rate to be under 9%, approaching 8.5% by the end of the year. This seems far too optimistic; based on this and other analyses, the Administration is once again overpromising what its policies can deliver. But there is actually more to hate about the deal the White House struck with the Republican leadership than just the giveaway of tax cuts to the wealthy. 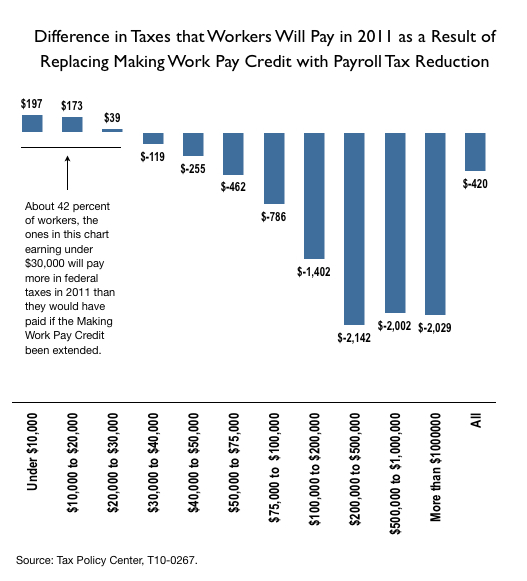 Replacing the Making Work Pay Credit with a payroll tax cut is bad policy on multiple grounds. The MWP is a credit of up to $400 for workers earning less than $75,000 a year, with workers making as little as $5,000 a year receiving the $400. With the payroll tax cut, a worker would have to earn $20,000 a year to get a $400 tax break. Workers earning less than $20,000 would see their taxes rise, while those making over $20,000 would get a further tax reduction, obviously a bad deal for low-income workers. The most insidious aspect of the payroll tax cut, however, is that it threatens the idea that Social Security is sacrosanct, a reality so important to the economic security of the nation that the taxes that support it should never be tampered with. The tax cut deal makes up the lost tax revenues from the partial payroll tax holiday out of general tax revenues. It would be far better to simply mail every working person and social security recipient a check from the Treasury out of general tax revenues – something I have advocated for in the past and that was done by both Presidents Clinton and Bush to deal with recession. Congressional Democrats have already changed the terms on which future negotiations between the White House and the Republican leadership will proceed. Progressives in Congress will do a great good for the country if they succeed in getting a better deal with Republicans. But in their criticisms, they should also note the cynical way in which hysteria over the deficit and the debt has been promoted, and the willingness of the White House and the Republicans to jettison these concerns to make sure the wealthy get to keep their tax cuts. Talk of spending cuts to “pay for” extending middle class tax cuts and unemployment benefits must be met by progressive Democrats with the same vigorous opposition that greeted the tax breaks for the wealthy. As long as household spending and business investment remain weak and 25 million workers are unemployed or underemployed, spending by the federal government that raises the deficit and the debt poses no danger to the economy. On the contrary, short-term increases in the deficit and debt are essential to creating jobs and a growing economy. Eighteen consecutive months. That’s how long unemployment has been over 10.5 percent. Officially, the worst spell of unemployment since the Great Depression came in 1982-83. Unemployment peaked in November and December of 1982 at a whopping 10.8 percent of the labor force. By contrast, the official rate of unemployment is only 9.8 percent, having peaked last October at 10.1. So how can I say unemployment has been over 10.5 percent for a year and a half? The official unemployment rate is a fine statistic as far as it goes. As unacceptable as 9.8 percent unemployment is on its face, it understates the historical depth of trouble in the labor market today. The U-6 alternative measure of unemployment is at 17.0 percent—more than 1 in 6 workers who have not completely dropped out of the labor force are unemployed or underemployed. Only 58.2 percent of the population age 16 and over are employed — the lowest rate of employment since the summer of 1983. The tax cut deal between the White House and Congressional Republicans would reduce the payroll tax rate on employees by 2 percentage points (from 6.2 percent to 4.2 percent) for one year in 2011, but fails to extend the more progressive Making Work Pay tax credit. Authorized for tax years 2009 and 2010 in the Recovery Act, the Making Work Pay tax credit provided a refundable tax credit of up to 6.2 percent of earned income, capped at $400 ($800 for joint returns), for taxpayers with adjusted gross incomes below $95,000 ($190,000 for joint filers). Because the payroll tax cut isn't capped, most tax filers (about 58 percent of those who benefit, according to the Tax Policy Center's preliminary estimates) will receive a greater benefit from it than they would have under the Making Work Pay credit. However, about 42 percent of tax filers will pay more in taxes in 2011 than they would of had the Making Work Pay Credit been extended. 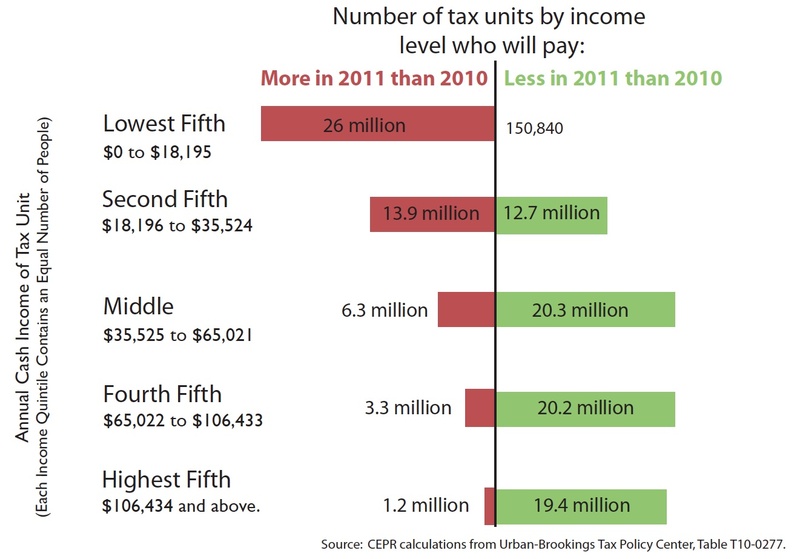 The chart below shows the average difference in taxes that workers will pay by income level. The deal would extend three other fairly targeted tax benefits for certain low-wage workers that were included in the Recovery Act: 1) an increase in the EITC phaseout threshold for married couples filing jointly; 2) an increase in the Earned Income Tax Credit (EITC) for families with three or more children; and 3) allowing families with income between $3,000 and roughly $13,000 to receive a refundable Child Tax Credit. These extensions are a good thing, but it's worth noting that low-wage workers without children don't benefit at all from them, and that the EITC more generally provides only a tiny benefit for workers without children (and none at all for those under age 25 or over age 65). In fact, for minimum wage workers without children (and even many with children), the current combined amount of earnings and the EITC that they receive today is substantially lower than the minimum wage earnings alone that they received in 1979. Instead of cutting payroll taxes directly, a better deal would extend the Making Work Pay tax credit and increase the cap to $600. If the misguided payroll tax cut stays in (for more on why it shouldn't, see this post by Dean), Congress should at least double the size of the EITC for workers without children (the maximum benefit is currently only $457) and extend it to workers under age 25 and age 65 or older, or adopt a partial restoration of Making Work Pay in a way that targets the benefits to workers with below-median incomes.